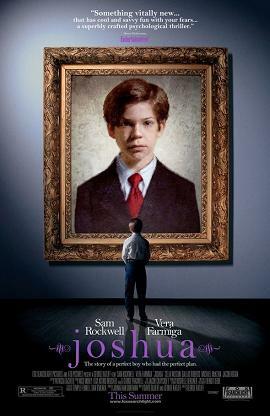 George Ratliff directs and co-writes Joshua a psychological thriller about Joshua (Jacob Kogan), a young boy whose peculiar behavor gradually traumatizes his mother (Vera Farmiga) and father (Sam Rockwell). George Ratliff has previously directred the documentary Hell House. This marks his debut into narrative feature films. I had the privilege to interview him. Fox Searchlight Pictures will release Joshua on July 6th, 2007 at AMC/Loews 84th St., Regal E-Walk 13 and Regal Union Square 14. NYC MOVIE GURU: Where did you study film and how did it prepare you for the real world? GR: I went to film school at the University of Texas. What was like the real world was that they only let 30 people into the Film Production Track per semester or per year and a lot of people were trying to get in. Basically, what you had to do was to sell yourself to this guy to convince him to let you in. I was rejected a couple of semesters before and was writing for the [school] newspaper to prove that I was interested. I also became a columnist through that, so that’s how I started writing in newspapers and it was to get into the Film Production Track. NYC MOVIE GURU: What made you decide to direct a scary movie? GR: I was very interested in doing a scary movie, but it was totally David [Gilbert]’s idea. He wanted to do a scary kid movie and I just started having kids and I really did not want to do this movie. Luckily, it was a lot of fun and didn’t affect my family. NYC MOVIE GURU: Why did you choose New York as the setting? GR: It could have been anywhere, but I think it’s much more interesting to make movies in Manhattan. There’s so much good baggage that comes with [it]. NYC MOVIE GURU: How did you collaborate with co-writer David Gilbert? GR: We mapped it all out and talk about scenes. He would write it and I would edit it. I’m really stealing a writing credit more than anything. David is a much better writer than I am and that’s why this collaboration really works for me. NYC MOVIE GURU: How did you work with Jacob Kogan to get such a creepy performance from him? GR: I’d love to take credit for that, but Jacob [Kogan is] the talent. He’s a very smart kid. We really knew when we saw him that he was [Joshua]. I was really surprised about his instincts when we went over the script. We went through the script, line by line, and talked about what it all was. His instinct was to rationalize what Joshua was doing every step of the way. You can’t really teach that—it’s really what an actor is supposed to do. During the shoot, he would be shadowing Sam [Rockwell]. He’s read all the same books Sam was reading. NYC MOVIE GURU: What other films were you reminded of while filming? GR: You can’t help but feel Rosemary’s Baby while shooting a movie like this. Joshua is much more akin to a film like With a Friend Like Harry…, Read My Lips and Caché , [though]. NYC MOVIE GURU: What are some of the scariest films you grew up with? GR: The movie that scared the hell out of me most as a kid was The Exorcist.That movie really messed me up. The Shining is one of my favorite movies. NYC MOVIE GURU: What were you like around the age of Joshua? GR: I grew up in Amarillo, TX which was very strange place. I got a long with everyone and I was a good, popular kid, but I never felt that I was in the right place. I came to New York, kind of, by accident when I was 18 and I felt at home for the very first time. It was a very weird feeling.